One of the best things about mountain biking is the places it takes you. As mountain bikers we get to travel to remote places, and see parts of the world most people don’t even know exist, and that’s pretty awesome. For us at The Loam Wolf, camping is a huge part of the mountain bike lifestyle. We don’t have the cash for fancy hotel rooms, and we’ll gladly trade a hot shower for a private view of the world. If you’re looking to step up your camping game and stay comfortable for multiple days in the dirt, few things will make as big of a difference as a roof top tent. Call us spoiled, but we’re never sleeping on the ground again. Yakima is a familiar name in our world as they’ve made bike racks for decades. 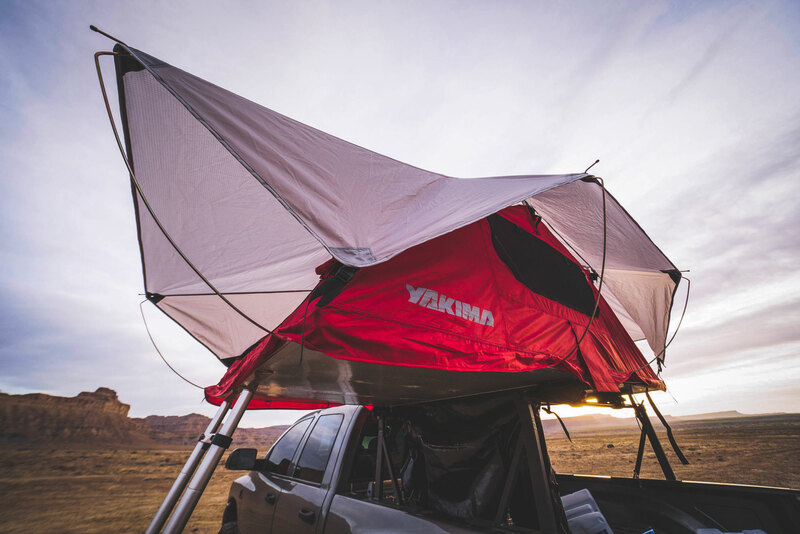 Recently, Yakima has been working hard to expand their offerings, entering the red-hot roof top tent world. The Yakima SkyRise tent represents a more consumer grade tent that places user-friendly operation as a primary goal. 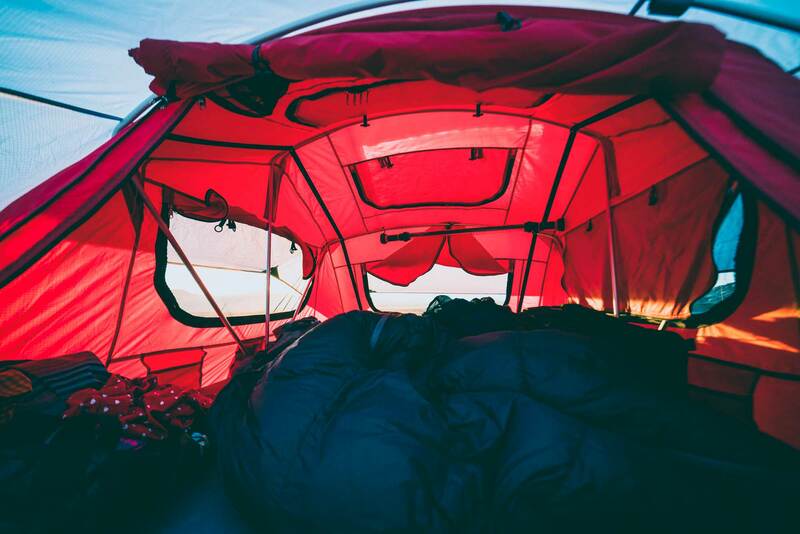 The SkyRise comes in two sizes: a two person Small tent, and a three person Medium. The small measures 84”x48” (95 pounds) and the medium comes in at 96”x56” (115 pounds). We opted for the medium so that we had some extra space for our gear inside the tent. 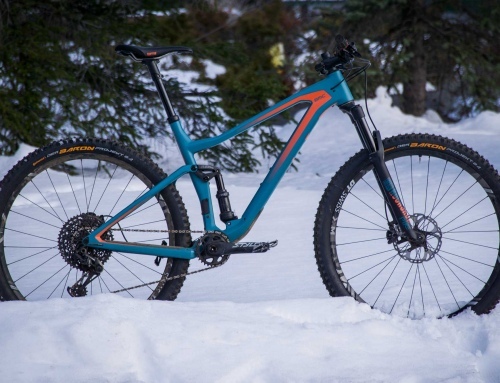 Construction: Coming in at just 115 pounds, the Medium SkyRise is one of the lightest three person RTTs on the market. The light weight makes a massive difference when you have to lift it onto the roof of a van, SUV or even truck bed rack. With two people, you can comfortably lift this tent on and off a vehicle on a matter of minutes. A 2.5-inch thick mold resistant foam cushion goes end to end in the tent, and has a removable, washable cover. The tent’s low weight comes thanks to the lightweight aluminum frame, PVC base, and 210D rip stop nylon tent exterior. The nylon tent itself isn’t waterproof, so Yakima relies on a 210D rip stop nylon rainfly that’s PU coated to make it waterproof. Inside, the aluminum frame under the canopy is well made, but lacks the condensation wrapping found on other higher end tents. When folded on the roof of the vehicle, the tent is protected by a thick, durable cover. Yakima’s cover design relies on velcro strips around the edges of the cover, zippers on each corner, and snap straps to secure and tighten the cover. It sounds complex, but it’s probably one of the easiest tent covers to use, and makes putting the tent away much faster than covers like the one on the ARB tent system. Thanks to the redundant attachment methods, you also decrease your changes of losing the tent cover on the highway after forgetting to secure a section of it. Assembly: Yakima provides detailed, printed instructions with the tent and includes all the tools needed to make the installation happen. Even for someone with limited mechanical experience or access to tools, the process is really simple. 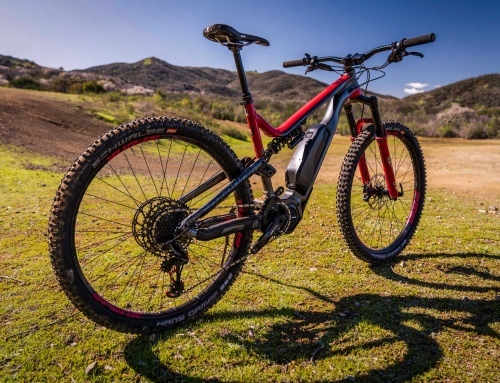 If the instructions leave any questions, Yakima has a detailed instructional video here. Don’t be shy, I watched it just to make sure I wasn’t making a mistake, which is easy when you’re mounting the tracks with the tent upside down. After unboxing the tent, the first step is to mount the tracks for the clamps. This is an important step because you need to decide what side of your vehicle you want to exit the tent from. I chose the driver’s side. The tent has pre-drilled holes for the different track configurations with stickers covering them when not in use. It helps to have an extra person to thread the hardware through the tent base. Once that’s done, you mount the ladder and cover, and you’re ready to put it on your vehicle. The tent even comes with the rainfly pre-installed. Another feature that helps the Yakima SkyRise excel in a crowded market is the mounting system. Yakima designed four simple locking clamps that tighten without the use of tools and four slide in tracks mounted on the bottom of the tent. We can’t say enough how much easier the tool free clamps are to use than the U bolts employed by other other roof top tents. Everyone else take note. The track can be configured in two orientations, meaning you can have your tent exit from the rear or on either side of the vehicle. The tool free mounting system is one of the simplest on the market, aiding in installation and removal. The built in locks are also a huge benefit for peace of mind when you’re parked in a less than ideal neighborhood. After all, these tents aren’t cheap! The Ladder is a quality aluminum unit, with plastic release latches on each step to let you dial in the length regardless of vehicle height or terrain. If you’re familiar with the RTT world, you’ll recognize the same ladder being used on several other offerings. Each step has textured grippers, and the ladder legs have wide rubber feet so they stay secure. Mounting: When it comes to mounting, options depend entirely on your vehicle. Yakima has a full catalog of rack systems, so most trucks, SUV’s and even cars are covered. Just remember that this tent has a weight rating of 600 pounds, plus the 115 pound tent itself, so make sure your vehicle and rack can take that weight. If you aren’t sure, Yakima has a list of compatible vehicles and racks. The two person SkyRise is a mere 95 pounds, so if the medium we tested is too big, the small should do the trick. It’s perfect to put on a small sedan like the Subaru Forester or Outback. I chose the Outdoorsman 300 Rack for my truck. Yakima has two truck rack options, the BedRock and Outdoorsman 300. Neither is height adjustable, so consumers have to make a choice between having the tent at the same height as the bed rails with the BedRock, or well over the cab height with the 300. I made a hybrid by taking my Outdoorsman 300 and cutting, sectioning, and re-welding right above the support bar so the racks are as short as possible. While that threw my warranty out the window, it got my tent lower. Sadly it’s still over the height of the cab, and I’m not a fan of the attachment clamps that pinch the bed rails as they move and don’t look good. I wish Yakima had a height adjustable option. For what it’s worth, I saw something from them at the LA auto show that may address my complaints above, but it isn’t officially released yet. Alright, enough about the details. Let’s get into how this tent performs in the wild! I figured there was no better way to break in my new tent than with a big camping trip, so I took it to Green River, Utah for a week of mountain biking and off roading (aka overlanding). Since that trip, I’ve also taken the tent on a few other camping trips with my girlfriend. At this point I’ve got thousands of miles and lots of time in the set up. I’ve got lots of friends with Tepui, CVT and other big name roof top tent brands, yet I’m very happy with the Yakima SkyRise. 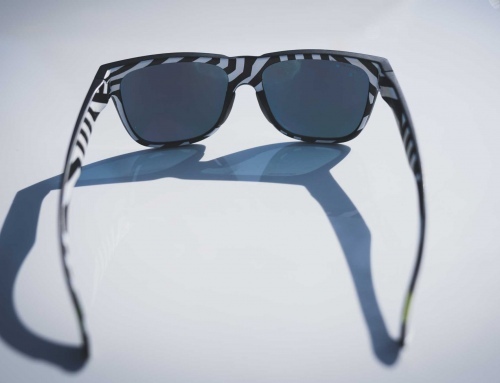 Its user friendly design and features list cater perfectly to the weekend adventure seeker. There’s all the stuff you’d expect from a quality RTT, without all the hassles typically associated with them. The Yakima SkyRise is everything you need as a weekend camper and nothing you don’t. Sure, you wouldn’t want to spend a week in windy, rainy weather, or take this tent to Alaska for a month, but that isn’t the target market for this tent anyway. Set up is quick, easy and painless. The longest part is taking off the black storage cover on the tent, and rolling it up with the provided straps. After that, simply extend the ladder, and pop the tent open. If you’re using the rain fly, the poles take about two minutes to insert into the eight corresponding holes on the tent frame. It’s important to make sure that the frame of the tent is properly locked into the center channel and is supported by the ladder though. The ladder is a key weight bearing component of the tent, so don’t put it down in sandy soil without rocks under the legs. Inside, the tent is very roomy and is filled with high quality zippers for every window and vent. There’s mesh-backed windows and doors on all four sides to keep out bugs, but let in light. Since the rainfly also has clear, plastic panels over the sun roof, the tent is still bright on a cloudy, rainy day. There’s also lots of handy storage pockets inside the tent for gear, phones etc. Yakima doesn’t send the tent with a built in light, but sells a small LED strip you can mount inside. I just use a light from Harbor Freight. The foam pad is very comfortable, and required no extra padding to get a good night of sleep on. It beats anything I’ve ever slept on in a ground tent! 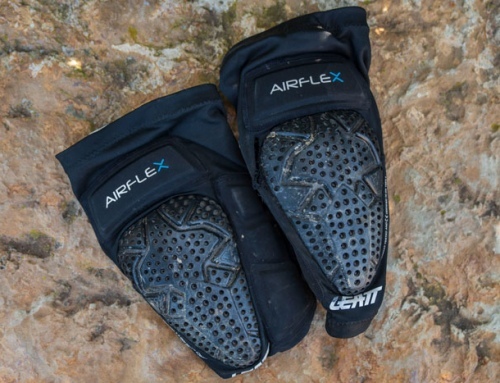 Designed to get dirty, the pad has a removable and washable cover. If you’ve ever been on an air mattress or blow up pad on a cold night, you’ll also appreciate how much warmer a foam pad is, especially one that’s off the cold, hard ground. I can also confirm that the tent’s waterproof rain fly is in fact water, snow and ice proof. There have been many wet mornings outside my tent, but I’ve always stayed perfectly dry. In fact, rainy weather is one of the areas a roof top tent excels the most. While ground tents get soggy and flooded as the water flows over the ground, a RTT keeps you high and dry. If you are considering a roof top tent, the Yakima SkyRise is worth looking at. As one of the lightest, most affordable, and most user friendly RTT’s on the market, it’s got a feature list that stands out among the crowd. The tent is lighter than many competitors but it does come at the expense of thinner materials. Yakima uses 210D ripstop nylon, similar to what is used in a thin backcountry ground tent with a 210D taped seam nylon rainfly whereas a CVT Mt. Bachelor weighs 120lbs and uses 280g poly/cotton rip stop canvas with a 420D polyester, tape seemed rain fly. If most of your camping is in areas without heavy winds or bad weather, these differences are inconsequential. Yes, the highest end premiere offerings are designed to be tougher, have more features to increase durability and it will be noticeable if you’re spending tons of time in your tent– especially in inclement weather. However, for people like me that are looking for an easy, comfy place to spend a couple nights on a fun camping trip, the SkyRise is perfect. This is hands down, one of the best weekend warrior tents available right now. If you’ve been on the fence about getting a roof top tent, go check out the SkyRise. I absolutely love mine. Pro tip: Since this tent is sold at REI, with a membership card and an online sale, you can swoop up the medium tent we tested for under a grand! Thats’ considerably less than almost any respectable quality tent on the market, making it an even better buy. Got a question? Comment below and we’ll answer it for you! Stay tuned for a video review coming soon.